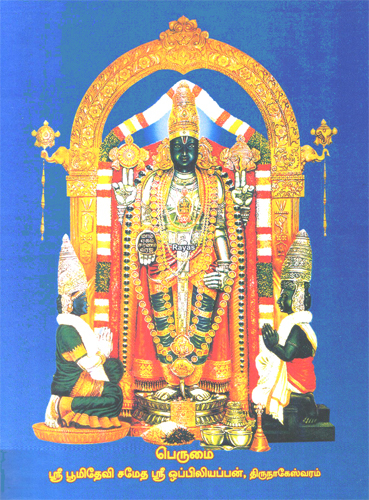 History : This temple is being calles as South Tirupathi, the presiding deity here is Lord Venkateswara. Devotees who are unable to make a trip to Tirupathi to fulfil their vows, may as well visit this temple. This is one of the 108 Divyadesas of Lord Perumal and has the added reputation of being the birth place – Avatara Sthala of Mother Bhoomadevi. Legand has it that Lord Oppilliappan married Bhoomidevi,who was brought up by sage Markanteya, here.The Lord came in the form of an old man and asked Markanteya to give his daughter Bhoomidevi in marriage to him .Markanteya said that his daughter was too young to cook food and that she did not even know how to use salt in cooking.To this the Lord said that he would forego salt in his food.Hence salt is not added in the prasadam prepared in the temple.The slogan uttered by Lord in His Gita Teaching “Maam Charanam Viraja” is written on His right hand pointing to His feet. This means “I take care of those surrendering to me”. Contact : Sri Oppiliyappan Temple, Thirunageswaram, Kumbakonam- 612-204. Thanjavur District.